Watson Chiropractic is Oak Park’s premiere clinic dedicated to helping people find better health, naturally… one woman, one child, one family at a time. We offer an individually centered approach that provides the time you deserve and the care that you need. 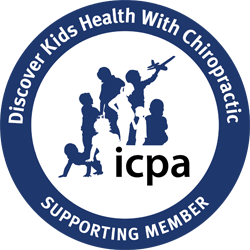 Dr. Sarah is the only ICPA Webster Certified chiropractor in Oak Park, River Forest, and the surrounding area. She has completed 200+ hours of post-graduate coursework for pediatric chiropractic care. We believe chiropractic is for every member of the family, and kids are encouraged to participate, and given their own space, in our family-centered practice with chiropractic techniques appropriate for all ages. When you schedule your initial appointment our staff will ask you some basic questions to determine the best appointment to suit your needs, and email you an intake packet. As a Chiropractic Physician, Dr. Sarah is focused on finding and correcting the root cause of your symptoms and our intake paperwork reflects this. You'll be asked a series of questions designed to identify physical, environmental, emotional, and psychological stressors. Dr. Sarah will review your intake paperwork before your first visit, at which time you'll have a conversation about your health goals and immediate problem, followed by a chiropractic examination. At your second visit you'll receive a Report of Findings, which combines all of the information gathered into a comprehensive plan to reach your short- and long-term wellness goals. This report includes recommendations for frequency of care, nutritional supplementation, additional testing, and a complete breakdown of cost. If you choose to bill insurance, we will provide you with an estimate of your patient responsibility. Practice members with persistent, chronic symptomatology may benefit from additional one-on-one support in our Integrative Wellness Program. This combines chiropractic care, extensive diagnostic testing, genetic intrepretation, personalized nutritional and lifestyle recommendations, and coordination of care with your other providers for a whole-body approach to better health, naturally.